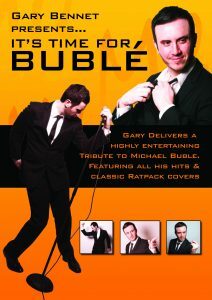 Gary Bennet It's time for Buble - Neil Drover - agency for live music, presenters and entertainers. Gary Bennet presents It's time for Buble Gary delivers a truly authentic tribute to Michael Buble. His show consists of 2 x 45 Min spots of all the classic ‘Buble’ hits and Swing & Rat Pack cover versions. His smooth vocals, charisma and energy will have any audience eating from the palm of his hand. Gary brings the distinctive sound of the celebrated Canadian crooner to your event with top quality performance, delight audiences of all ages with a truly show-stopping performance. Loved around the world for his easy listening style covers of popular jazz standards and his catchy original songs, Michael Bublé is an internationally acclaimed singer inspired by greats such as Frank Sinatra and Tony Bennett. Gary performs some of the best-loved hits include ‘Haven’t Met You Yet’, ‘Everything’, ‘Home’, ‘It’s A Beautiful Day’, ‘Feeling Good’, and ‘Cry Me A River’. Plus some Rat Pack and swing classics Gary became an accomplished guitarist songwriter and musician playing in numerous bands finding success when he and childhood friends formed the band 'Solus'. Solus went on to release three E.P's, toured the UK and Ireland, regularly played prestigious venues such as King Tuts Wah Wah Hut, received airplay on mainstream Scottish radio stations such as Clyde 1 and BBC Radio Scotland and Solus were also crowned 'New Talent' winners of the Kirkmichael International Guitar Festival. Gary has since gone on to perform as a solo artist and is also currently the male vocalist for the 'Cosmopolitan Big Band'. Acting was never far from Gary's thoughts, though, and he first caught the acting bug when he played 'Danny Zuko' in his High School production of 'Grease'. Gary went on to gain lots of invaluable experience performing with two of Scotland's Premiere Amateur Theatre groups 'Pantheon' and 'Bookends' performing in numerous musicals and plays at the Kings Theatre Glasgow playing lead and principal roles in many musicals Gary landed his first professional Acting credits in 2011 and 2012 playing Community Cop 'PC Bennet' in BBC Scotland's 'River City'. He also landed the roles of 'Andy' in ‘The Steamie’ and ‘Martini’ in 'One Flew Over the Cuckoo’s Nest' in professional touring productions with AJ Productions.